At Penrith Dental Clinic, we believe that there are no compromises with dental care. That is why our state-of-the-art technology is unequalled and is best suited for all your dental needs. Our stellar technology includes the dental microscope, one of the most advanced tools in the field of dentistry. The dental microscope is similar to the standard microscope in that it zooms into microbic objects and areas. 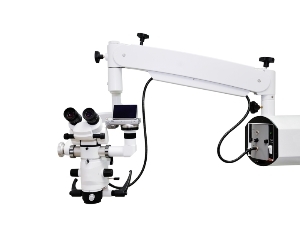 However, as opposed to a table-mounted stationary microscope, the dental microscope avails objective lenses on movable and flexible extendable arms. The dental microscope’s zoom is miles ahead of the regular magnification, as it uses zoom lenses that offer more control over focus and increased ability to magnify images. The cutting-edge technology of a dental microscope offers a great advantage in accuracy and efficiency in a number of dental treatments. What are the Advantages of Microscope Dentistry? What kind of Dental Procedures employ Microscope Dentistry? Dental Checkups – The benefits of the dental microscope in regular check-ups helps in immediate detection and better prevention of dental health issues. Your Penrith dentist uses this technology to arrive at a more precise diagnosis, and in turn, creates a customised treatment plan that deals with your emergency as well as long-term dental needs. Managing Gum Disease – Microscope Dentistry offers a greater level of magnification and focus in examining and evaluating your teeth, condition of gums, and various other areas of your mouth. In case surgery is deemed necessary, the dental microscope ensures total safety and accuracy of the whole procedure. Root Canal Therapy – Microscope dentistry renders a new advantage to root canal treatments, as it allows a more magnified view of very small root openings inside the tooth, called ‘canal orifices’. These root openings are microscopic enough to be missed during root canal treatment performed under a naked eye, and can increase chances of failed treatment. However, at Penrith Dental Clinic, we do our best to improve the success rate in every root canal treatment through effective use of the dental microscope. Restorative Dentistry – Microscope dentistry is availed to ensure top quality tooth restorations and replacements to take care of the missing teeth. It effectively aids in getting ready your teeth and carefully polishing the teeth margins to ensure quality and longevity of new replacements. Microscope dentistry also assists in isolating and addressing other dental issues at the outset. Penrith Dental Clinic offers you the advantages of modern dentistry and stellar professional care. Your reliable dentist in Penrith is set up with the most sophisticated tools and modern techniques, including Microscope Dentistry that improves the precision, safety and efficiency of your dental treatments. Call us now on 02 4721 7771 or just arrange for an appointment on our website.